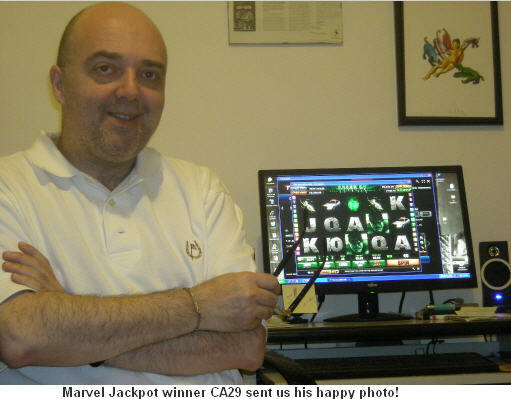 Fly Casino is thrilled to congratulate CA29 of Italy for his amazing €25,622.21 Marvel Progressive Jackpot win on Wednesday April 23, 2014. Our latest mega winner started his day at Fly Casino with a €100 deposit and turned that into a truly elevated gaming experience! CA29 was betting €.50 a spin on Hulk 50-Lines and was a little less than even with €75 in his account. On the next spin, the Marvel Progressive Jackpot feature randomly appeared and awarded him the Super Power Jackpot! Our happy winner has been with Fly Casino since December of 2013 and is one of our most loyal members. We cannot be more thrilled to for him and his family! Saturday April 26, 2014 00:00GMT until 23:59GMT on your first deposit of $/£/€10 or more our members are eligible for our exciting Your Choice bonus. On Tuesday April 29, 2014 from 00:00GMT until 23:59 GMT all members on your first deposit of $/£/€30 or more will receive a 240% deposit bonus up to $/£/€150.00.